If you are an avid video game player or if you love relaxing while listening to music and watching TV, you know that it can be hard to get and stay comfortable in most reclining chairs. Some gaming chairs don’t offer enough cushioning support while others have arm rests that interfere with movement and game play. If that isn’t bad enough, some of these chairs are so uncomfortable that you often find yourself standing while playing. We wanted to know if there was a reclining chair that was comfortable enough to support us during our marathon gaming sessions, with a sound system clear enough to let us enjoy our favorite music. It also goes without saying that we wanted the reclining gaming chair to be wireless. 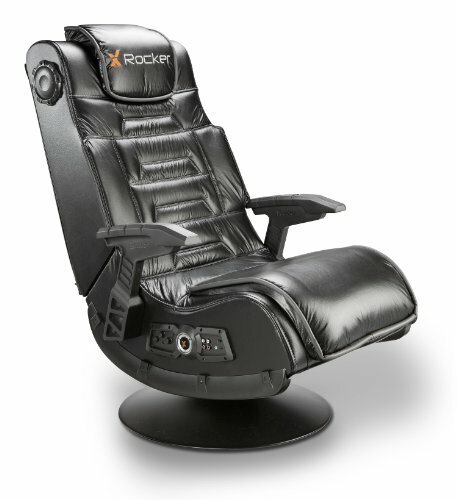 We found the X Rocker Video Gaming Chair and decided to see if it could hold up to a long day of watching TV and playing video games. This sleek and stylish synthetic leather gaming chair lets you see, hear, and feel all of the music and adventure. The chair can also connect to other gaming chairs for even more intense action and excitement with other players. Two speakers and a subwoofer give you complete surround sound which is great for listening to music, watching TV, and playing games. Smaller speakers can also be found in other areas of the chair to help improve your total listening experience. The pedestal design gives you enough extra height so you can pivot with the action and tilt back for better viewing angles. The erogonically engineered arms never get in the way of game play, and can be used for support during some of your shooting and target games. Along with the pivoting arms, the chair can be easily adjusted to several different positions. Sit straight up during all of the intense action packed moments of game play, and recline comfortably back to listen to music or watch TV. One of the things that we liked best about this gaming chair was how easy it is to use. The controls are conveniently located on the side of the chair, withing easy reach while you are sitting. Along with knobs for bass and volume, you also have the output/input jacks for connecting to other gaming chairs and your TV. The wireless transmitter is also your RCA cable which means you never have to worry about tripping over wires again. This great looking chair has quickly become one of our favorites with its surround sound and interactive audio features. It is incredibiliy comfortable and can support your lower back and legs for hours. Extra padding in the seat and back, along with a cushioned headrest make this a great chair to have the next time you are planning to spend the day gaming.